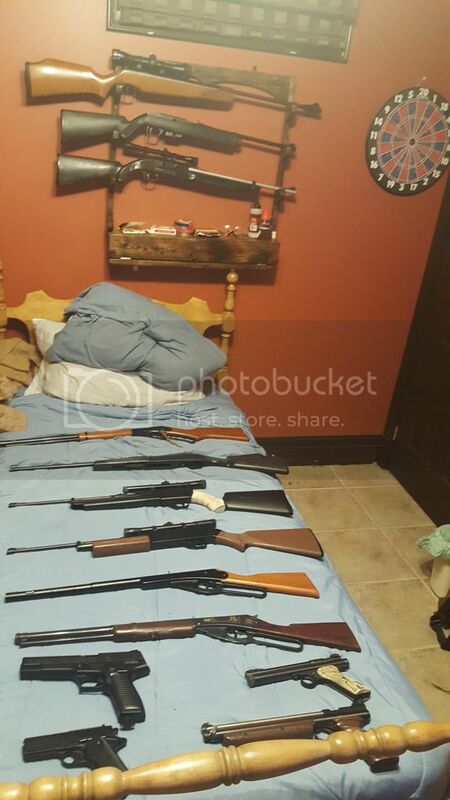 Post subject: Re: Do i Have two too many Airguns...? i bought 38 in 2018. 2nd most in this 9 year old hobby/passion/sport/past time/collection was 2015 when i got 35.
from 2018, the oldest one is either a Daisy Red Ryder circa 1959, or a HY-SCORE 800B pistol, 1958-1960ish. 24 of those 38 i bought from this forum! one of which was from oshoot, which i found thru the forum. 3 came from wllm995, 4 from wesb2007, jimmy was good for 5, plus a free one. so 6. 3 is the number of new friends i have that will take my money face-to-face.. no shame these guys.. lol. wllm995 (hometown- 5 blocks away! ), HuskyDude, a 2 hour drive.. where a son lives! and twister- just 3 time zones away. 1 Marksman Repeater was given to me at a garage sale 'cause 'it was jammed'. yay for people that didn't know how it operated. 1 was from russia w/ love (Baikal MP 651-K Modular-the gun w/ the periscope), 1 from spain (NORICA MOD. 56), 2x germany, an Ekol ES55 from turkey. 2 PCPs opened a new facet of air gunning to me this year. a PP700S-A and CR600Wes. ..and wllm995 has a Cometa Indian listed. Yes you can have to many guns but only if you have ones you don't ever shoot then what's the point of having them? still in their boxes - not touched yet. Likely in the low teens for numbers, THAT is addiction. While back - he liked the Leshiy so much, he bought 2 - still not shot. Hey, I noticed today is my anniversary of joining CAF...9 years ago I only had one air gun and it was a very sad little thing at that. Then I bought a Benjamin Classic, a Winchester 500XS, a Canadian Hunter, a HW97K, a Slavia 631,.....and kept going until I had too many and then way too many. I have been to rehab and now I just have too many. If you don't yet have too many I have a few for sale that would be happy to be bought and shot or just sit and look pretty in your closet. dude, where was your rehab centre? what city? are there nation-wide meetings? do you think i could pick up some pistols for cheap? i'd like a 622X Daisy. like, do you guys hold a flea mkt? or is there an online listing?? continued success to you and our pathetic addicted brothers. To cherish them. I do not need to shoot any to remember the joy they all have brought me. I mourn for every that I have lost to circumstances beyond my control. Even my Daisy cub. OO-I see a few rifles with the clip Henry-super,and you can about them in more detail,please. Yes, and the bed is great.